Ybor City is a community all to itself that exists within the city limits of Tampa, Florida. Its history shows on its sleeve with a remarkable number of buildings preserved from the turn of the century in 1900. But to say that Ybor City’s history is wrapped up in its buildings is selling the city short. The stories go deep and the history is quite fascinating. It roots sprout from the American cigar industry and its citizens actually played a part in the revolution to end Spanish rule in Cuba. While being deep in the south, it also had major players seeking to end racism not just in the U.S. but in Cuba. So how did this unassuming town that most people have never heard of grab its slice history? It all started with cigars. A Cuban cigar maker of Spanish descent by the name of Vicente Maritnez Ybor immigrated to Key West and then the west coast of Florida. He set up shop in 1885 just north of Tampa on land that was not part of Tampa at the time. Back then, Tampa was a town rather than the big city that it is today. Ybor set up cigar making facilities and invited Cuban immigrants to join him as laborers. Housing and at-work entertainment were the perks, which presumably made working for Ybor a pleasant experience. Why was Cuban immigration on the rise? The answer is the Cuban fight for independence against Spanish rule. Land owners and businessmen in Cuba set the stage for the Ten Years War in Cuba, which ended in defeat. Among the issues were high taxes from Spain and the persistence of slavery. The United State had ended slavery just years before, setting the stage for Cuba to fight for the same. The Ten Years War was won by Spain but thanks to brutality against the peoples of Cuba by a cruel general, the people of the country had bonded in a movement against their European rulers. 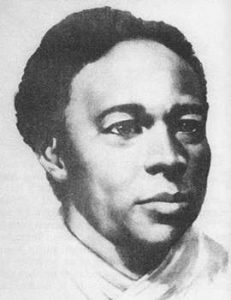 Many escaped to the U.S.
Vicente Martinez Ybor had sided with the revolutionaries, the threat spurring his immigration to the United States. Having fled the threat of violence himself, his cigar factories became a natural refuge of choice for other Cubans fleeing the wars. Ybor hired readers to not only entertain his workers while they rolled their world class cigars, but those readers also kept the workers up to date on the news about the Cuban liberation efforts. Ybor City became a hot spot for the political voice for the freedom of Cuba. A pair of outstanding figures from that era who made Ybor city their home for a while were Jose Marti and Paulina Pedroso. 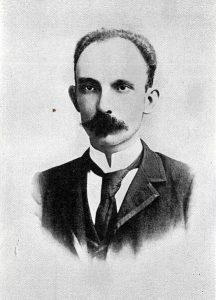 Paulina was an independence advocate and Jose Marti an outspoken writer and poet who promoted the Cuban revolution first from New York and then Ybor City. One can only imagine the scene at the time; Jose Marti living in New York, only to hear of a Cuban population growing in Florida that was home to an increasing number of liberation-minded individuals. 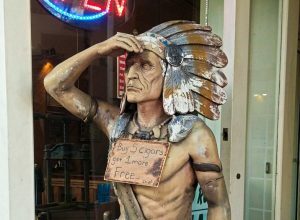 While New York had communication lines to the world, Ybor City had the people who needed his message most and with whom, presumably, he might conspire. Paulina Pedroso was an amazing woman for her time. She and her husband left Cuba and settled in Ybor City, she taking up the mantle of outspoken freedom fighter. She not only took on the battle for Cuban independence but also equality between the white Cubans and the Afro-Cubans, she a member of the latter. She did so from the southern United States not long after the ending of the American Civil War, surely a daunting task. When Marti visited Ybor City, he stayed at the Pedroso boarding house. To promote her idea of equality between the races, Pedroso and Marti would walk hand in hand through Ybor City. Sadly, their idea of equality did not prevail and the less liberal-minded citizens of Ybor City managed to get the Jim Crow segregation laws enforced in Ybor, a city that enjoyed an unusually high mix of races and nationalities for the time period. Members of Cuban clubs of the time had to thereafter hold their meeting separately. Ybor City is known best for its cigars, however, rather than its role in the liberation of Cuba from Spain. Thanks to promotion of the independence wars by not only Marti and other Cubans but by newspaper mogul William Randolph Hearst, who had his own motivations, the United States chose to side with Cuba. The intervention led the already embattled Spanish to give up Cuba. The U.S. helped Cuba to create its own nation and laws – with a few pro-U.S. strings attached. Cuba saw its freedom at last in 1902. By 1902, Vicente Maritnez Ybor had passed away. His legacy, however, had lived on. He had created the largest manufacturing center for cigars in the U.S. and created an entire city surrounding it. Tampa annexed Ybor not long after its inception but Ybor City never lost its name or its separate identity. It became a well-known cigar manufacturing center attracting a handful of other cigar manufacturers, truly making Ybor the cigar capital of the United States. The great depression struck Ybor City hard. In addition to that financial collapse, industrialization of cigar making created crushing competition for the hands-on cigar rollers. Ybor city declined, cigar factories closed and the city fell into a slum. Thanks to the remarkable turn of the century architecture, the city received preservation many decades later and is now on the National Register of Historic Places. Ybor City has become a tourist attraction. 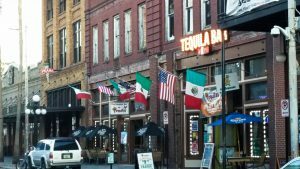 Fun pubs and racy live theaters line streets of red and blond brick preserved from the late 1800’s. 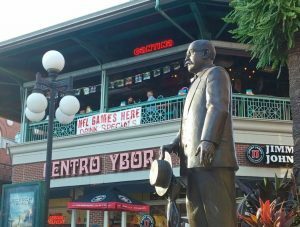 Parks commemorate the city’s history and you will find a statue of Vicente Maritnez Ybor in the middle of town, reminding you of the mark he left behind. A park is named after independence leader Jose Marti and, another, named after Paulina Pedroso, sits upon land purchased long ago by the Cuban government and is still their property! If you are looking for an afternoon of casual strolling or scenic driving through fascinating reminders of days gone by, Ybor City is for you. We recommend parking and strolling the streets. You will find modern day cigar rolling shops where you can watch the craftsmen work. The pubs, located in iconic historic buildings are a lot of fun. An electric trolley provides transportation, and rental bikes are easy to acquire. 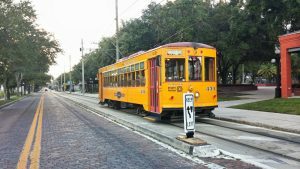 If you are in the Tampa Bay area and are looking for a relaxed and interesting day trip, put Ybor City on your list.